Endothelial dysfunction predicts cardiovascular damage and renal involvement. Animal experiments and human studies indicate an increased nitric oxide (NO) activity and endothelial NO synthase (NOS) expression in the early stage of type 2 diabetes. The aim of the study was to assess the effect of linagliptin on the endothelial function of the renal vasculature. 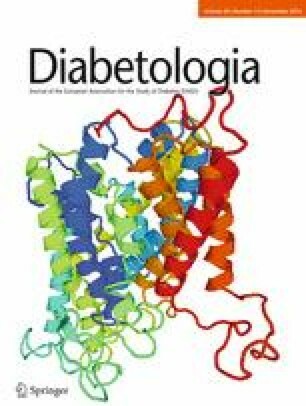 In this randomised, double-blind, parallel-group, investigator-initiated trial, 62 patients with type 2 diabetes were randomly assigned (by computer-generated random code) to receive linagliptin 5 mg (n = 30) or placebo (n = 32) for 4 weeks. The primary objective was to assess endothelial function of the renal vasculature, by constant-infusion input-clearance and urinary albumin/creatinine ratio (UACR), both before and after blockade of NOS with N G-monomethyl-l-arginine (L-NMMA). Treatment with linagliptin for 4 weeks reduced fasting, postprandial blood glucose and HbA1c, although not significantly; no change occurred with placebo. Renal plasma flow (RPF) did not change after linagliptin or placebo. After 4 weeks the absolute change in RPF due to L-NMMA was smaller in the linagliptin group than in the placebo group (−46.8 ± 34 vs −65.1 ± 36 ml/min, p = 0.045), indicating a lower basal NO activity after treatment with linagliptin. Consistently, the response of UACR to L-NMMA increased in the placebo group (p = 0.059) but not in the linagliptin group (p = 0.276), pointing to an upregulation of NO activity in the placebo group. No clinically meaningful safety concerns were evident. Our data suggest that treatment with the dipeptidyl peptidase-4 inhibitor linagliptin for 4 weeks prevented the impairment of renal endothelial function due to hyperglycaemia in type 2 diabetes. This study was funded by Boehringer Ingelheim. Diabetic nephropathy is the cause of up to 50% of cases of end-stage renal disease (ESRD). Hence, an early intervention to prevent structural kidney damage is a desirable therapeutic goal. In the early stage of diabetic nephropathy endothelial dysfunction is a key pathogenetic mechanism as indicated by an increased leakage of albumin through the glomerular filtration barrier [1, 2, 3]. Endothelium-derived nitric oxide (NO) generated by endothelial NO synthase (eNOS) has been widely used as a marker of endothelial function in clinical research, and altered production and release of NO (i.e. reduced basal NO activity) can be directly assessed by systemic infusion of N G-monomethyl-l-arginine (L-NMMA) in humans [4, 5]. Increased basal NO activity is associated with glomerular hyperfiltration, the first stage of diabetic nephropathy [6, 7]. Dipeptidyl peptidase-4 (DPP-4) inhibitors are glucose-lowering drugs that act by inhibiting the enzyme DPP-4, resulting in an increased and prolonged effect of glucagon-like peptide-1 (GLP-1) . In a diabetic rat model it was shown that GLP-1 infusion nearly re-established normal vascular tone of aortic strips . Moreover, in vitro studies revealed that DPP-4 is expressed in endothelial cells and that inhibition of DPP-4 reduced the microvascular tone through direct mediation of the NO system . Linagliptin is a highly tissue-penetrative DPP-4 inhibitor. In Zucker diabetic fatty rats linagliptin augmented vascular relaxation . In Dahl-sensitive hypertensive rats linagliptin was found to improve vascular function and diabetic nephropathy, indicated by reduced albuminuria and renal mRNA levels of intercellular adhesion molecule-1 (ICAM-1), and in a rat model of type 1 diabetes it improved lymphocyte infiltration into the glomeruli [12, 13]. However, similar analyses of the effects of DPP-4 inhibitors on vascular and endothelial function in humans with diabetes mellitus are lacking. The aim of our study was to determine whether linagliptin improves renal vascular endothelium function in patients with type 2 diabetes in the early stage of their disease. This randomised, double-blind, parallel-group, investigator-initiated trial was conducted under the legal sponsorship of the Medical Faculty of Friedrich-Alexander University Erlangen-Nürnberg, Germany between October 2012 and December 2013. Participants were recruited from the University Outpatient Clinic, referring physicians and advertisements in local newspapers in the area of Erlangen-Nürnberg, Germany, and eligible individuals were enrolled consecutively. Written informed consent was obtained prior to study inclusion. Participants underwent a run-in/wash-out phase of 2 weeks if untreated (15%) or 4 weeks if pre-treated with any blood-glucose-lowering agent (85%). Thereafter, baseline measurement of renal endothelial function was performed and study participants were randomly assigned to receive either linagliptin 5 mg or placebo for 4 weeks. Measurements of renal endothelial function were repeated at the end of the treatment phase. Patient disposition is given in Fig. 1. The local Pharmacy of the University Hospital Erlangen manufactured identical-appearing study medication. The study protocol was approved by the Local Ethics Committee (University of Erlangen-Nürnberg) and the study was conducted in accordance with the Declaration of Helsinki and the principles of ‘good clinical practice’ (GCP) guidelines. The study was registered at Clinical Trials.gov (registration no. NCT01835678). The financial supporter Boehringer Ingelheim did not contribute to study conduction, data collection or interpretation of the data. Inclusion criteria were individuals with type 2 diabetes aged between 18 and 65 years. Main exclusion criteria were use of insulin, thiazolidinedione or DPP-4 inhibitor within the last 3 months or use of any other oral glucose-lowering drug that could not be discontinued for the study period. Furthermore, patients with HbA1c > 10% (86 mmol/mol), urinary albumin to creatinine ratio (UACR) > 11.3 mg/mmol (>100 mg/g) creatinine, estimated glomerular filtration rate (eGFR) < 45 ml min−1 1.73 m−2, and cardio- and cerebrovascular event within the previous 6 months were excluded. Female participants had to have a negative pregnancy test before and during the study period. Renal haemodynamics were assessed using the constant-infusion input-clearance technique with inulin (Inutest; Fresenius, Linz, Austria) and sodium p-aminohippurate (PAH) (Clinalfa, Basel, Switzerland) for measuring GFR and renal plasma flow (RPF), respectively, (www.crc-erlangen.de) [14, 15]. In brief, after bolus infusion of inulin and PAH over 15 min and a subsequent constant infusion over 105 min, a steady state between input and renal excretion of the tracer substances is reached (Fig. 2). Duplicate blood samples were collected for the assessment of RPF and GFR. Then, the competitive NOS inhibitor L-NMMA was administered intravenously as a bolus infusion (3 mg/kg over 5 min) followed by constant infusion (1.25 mg/kg over 25 min), resulting in a total dose of L-NMMA of 4.25 mg/kg body weight. Again, a steady state was achieved and duplicate blood samples were collected for the assessment of RPF and GFR . PAH was measured according to previously described methods . Inulin was measured indirectly by converting inulin to fructose and subsequently measuring fructose by an enzymatic method (Boehringer Mannheim, Mannheim, Germany). Each blood sample was measured in duplicate with a coefficient variation of <5%. Intraglomerular pressure (Pglom) and resistances of the afferent (RA) and efferent (RE) arterioles were calculated according to the model originally established by Gomez , which has been discussed by Guidi et al  and repeatedly applied in previous studies [19, 20]. Before the experimental protocol (constant-infusion input-clearance with PAH and inulin) was started, participants were advised to empty the bladder, and the urine was discarded. A constant infusion (250 ml/h) of sodium chloride was administered throughout the protocol. After 120 min of rest (basal urine), and again after 30 min (NOS inhibition with L-NMMA), participants were advised to urinate. All samples were processed centrally at the biochemistry laboratory of the University of Erlangen-Nürnberg according to established methods. In brief, the urinary albumin concentration was measured by a turbidimetric method (inter-assay CV 3.44%) and the creatinine concentration in urine was measured photometrically by the Jaffé method (inter-assay CV 2.03%). UACR was calculated by dividing urinary albumin concentration by urinary creatinine concentration. Liver-type fatty acid binding protein (L-FABP), neutrophil gelatinase-associated lipocalin (NGAL), kidney injury molecule-1 (KIM-1) and tissue inhibitor of metalloproteinase-2 (TIMP-2) levels were determined using individual ELISAs (R&D Systems Europe, Abingdon, UK). High-sensitivity C-reactive protein (hs-CRP) was determined using a particle-enhanced nephelometric assay. Monocyte chemoattractant protein-1 (MCP-1) was determined using an ELISA (R&D Systems Europe). Serum nitrite (NO2 −) and nitrate (NO3 −) concentrations, as an index of NO production/oxidative stress, were determined using a two-option assay (R&D Systems Europe). According to the statistical analysis plan the following steps of analysis were specified. The primary step was to compare renal endothelial function (basal NO activity) between the two randomised groups, assessed at the 4 weeks examination, after the 2–4 weeks of run-in/wash-out phase and an additional 4 weeks of treatment phase. Sample size calculation was based on data from prior studies in individuals with type 2 diabetes [5, 21]. Secondary steps were to analyse all other variables at the 4 weeks examination. Finally changes from baseline to the 4 weeks examination were separately analysed in the linagliptin and placebo groups. Normal distribution of data was confirmed by Kolmogorov–Smirnov tests before further analysis. Normally distributed data were compared by paired and unpaired Student’s t test and were expressed as mean ± SD. UACR data were not normally distributed; therefore the Mann–Whitney U test and Wilcoxon rank sum test were used and results were expressed as median (interquartile range). Two-tailed values of p < 0.05 were considered statistically significant. All analyses were performed using IBM SPSS Statistics for Windows, Version 21.0 (IBM, Armonk, NY, USA). Our study population (mean age 56.9 years, HbA1c 6.89% [52 mmol/mol], blood pressure 132/79 mmHg) had a short duration of diabetes (4.5 years), normal renal function and albuminuria < 11.3 mg/mmol (<100 mg/g creatinine). At baseline (after the run-in/wash-out phase) no significant differences in clinical characteristics were documented between patients randomised to receive linagliptin and placebo treatment (Table 1). Also, no difference in previous glucose-lowering medication or current antihypertensive drugs and statins existed (data not shown). After 4 weeks of treatment, fasting (7.61 ± 1.4 vs 7.17 ± 1.7 mmol/l, p = 0.072) and postprandial (9.50 ± 1.2 vs 8.89 ± 2.5 mmol/l, p = 0.076) blood glucose and HbA1c (6.98 ± 0.7% [53 ± 7.7 mmol/mol] vs 6.86 ± 0.8% [51 ± 8.7 mmol/mol], p = 0.089) were reduced (although not significantly) in the linagliptin group whereas no change was noted in the placebo group (fasting glucose 7.44 ± 1.8 v 7.67 ± 1.8 mmol/l, p = 0.218; postprandial glucose 9.61 ± 2.9 vs 9.28 ± 2.8 mmol/l, p = 0.0225; HbA1c 6.79 ± 0.8% [51 ± 8.7 mmol/mol] vs 6.83 ± 0.9% [51 ± 9.8 mmol/mol], p = 0.559). The change in RPF due to L-NMMA was smaller after 4 weeks of treatment with linagliptin compared with placebo (irrespective of whether expressed in absolute [p = 0.045, Table 2] or percentage values [p = 0.046, Fig. 3]), indicating lower basal NO activity after treatment with linagliptin. In accordance, when baseline was compared with treatment groups, the change in RPF due to L-NMMA was greater (though not statistically significantly) after placebo (p = 0.058), but remained unchanged after linagliptin treatment (p = 0.823, Table 2). After 4 weeks of treatment, there was no difference in RPF and GFR between linagliptin and placebo groups (Table 2). Comparing renal haemodynamics at baseline with those after 4 weeks of treatment, there was no difference in RPF and GFR between linagliptin and placebo groups, respectively (Table 2). After 4 weeks of treatment with linagliptin compared with placebo, no significant differences in Pglom, RA, RE or the ratio RE/RA were observed (Table 2). There were no significant differences in intrarenal haemodynamics after linagliptin treatment compared with baseline. In contrast, when comparing intrarenal haemodynamics at baseline with placebo treatment, a significant reduction in RA, and hence an increase in RE/RA, was observed, whereas there was no change in Pglom and RE (Table 2). After 4 weeks of treatment, there was no difference in the response of UACR due to L-NMMA between linagliptin and placebo (median [interquartile range]: 59.5 [11.7–160]%) vs 20.4 [−8.5 to 139]%, p = 0.233). At baseline (p = 0.043) and after 4 weeks of placebo treatment (p = 0.001) there was a significant increase in UACR in response to L-NMMA. This increase in response was enhanced after 4 weeks of placebo compared with baseline (p = 0.059), pointing toward an upregulation of NO activity in the (‘untreated’) placebo group, whereas UACR in response to L-NMMA did not change in the linagliptin group (p = 0.276) (Fig. 4). KIM-1 levels increased non-significantly after linagliptin treatment compared with placebo treatment (p = 0.067), whereas no changes in NGAL, L-FABP or TIMP-2 were noted. Comparing tubular markers before (baseline) and after placebo treatment, there was a significant increase in TIMP-2 levels after 4 weeks of treatment (p = 0.048) and a non-significant increase in KIM-1 levels (p = 0.057). No significant differences were observed between baseline and 4 weeks of linagliptin treatment (Table 3). Comparing 4 weeks of treatment with linagliptin vs placebo, hs-CRP (p = 0.019, Fig. 5), but not MCP-1 (412 ± 116 vs 452 ± 145 ng/ml, p = 0.260), was significantly lower. No significant differences in hs-CRP and MCP-1 levels (447 ± 150 vs 452 ± 145 ng/ml, p = 0.642) were observed between baseline and 4 weeks of treatment with placebo. In contrast, after linagliptin treatment both hs-CRP (p = 0.026, Fig. 5) and MCP-1 (412 ± 116 vs 440 ± 139 ng/ml, p = 0.022) were significantly reduced compared with levels at baseline. Baseline serum NO2 − and NO3 − concentration did not differ between the placebo and linagliptin groups (p = 0.117). However, after 4 weeks of treatment serum NO2 − and NO3 − concentrations increased in the placebo group but decreased in the linagliptin group, resulting in a significant difference (5.14 ± 14 mmol/l vs −4.16 ± 11 mmol/l, p = 0.042). The principal finding of our study is that the change in RPF due to L-NMMA, indicative of basal NO activity, was smaller after 4 weeks of treatment with linagliptin compared with placebo. This finding has to be interpreted in consideration of the fact that the final examination took place after 2–4 weeks of run-in/wash-out phase (baseline examination) and 4 weeks of treatment with either placebo or linagliptin. Interestingly, in the placebo group basal NO activity showed a non-significant increase (p = 0.058), which was not at all the case in the linagliptin group. This suggests that the increase in NO production in type 2 diabetes, such as that observed in the participants off glucose-lowering therapy for 8 weeks in the placebo group, is prevented by linagliptin treatment. This result is in line with findings from previous animal experiments and histopathological human studies. In a rat model of streptozotocin (STZ)-induced diabetes, plasma and urinary excretion levels of stable products of NO oxidation were considerably higher than in control rats, suggesting an increased NO synthesis . Accordingly, in humans with diabetes, increased NO synthesis assessed by serum NO2 − and NO3 − concentrations was documented . Moreover, increased renal expression of endothelial NOS and production of inducible NOS has been observed even in the very early stages of the disease, at 1 week after STZ induction of diabetes in rats . Again, eNOS expression was increased and related to vascular lesions and the degree of proteinuria in renal biopsies from humans with diabetic nephropathy . The increased NO expression and activity is commonly considered to be reactive and compensatory to the increased oxidative stress caused by increased blood glucose concentrations (glucotoxicity) [26, 27]. Indeed, in individuals with type 2 diabetes vitamin C infusion augmented endothelium-dependent vasodilatation of the forearm blood flow and of the renal vasculature [28, 29]. Moreover, it was shown in individuals with type 2 diabetes that poor glycaemic control is related to an increased NO activity of the renal circulation  and that fluctuating glucose concentrations augment oxidative stress . In accordance, treatment with gliptins, to blunt glycaemic fluctuations, was associated with reduced oxidative stress [13, 31]. Thus, our main finding of a lower basal NO activity in the group treated for 4 weeks with linagliptin points to a lesser degree of oxidative stress and lesser compensatory increased NO activity than in the placebo group. These notions are supported by additional analyses of collected samples for serum NO2 − and NO3 − concentrations as an index of NO production/oxidative stress. Starting from comparable baseline values, serum NO2 − and NO3 − concentrations increased in the placebo group but decreased in the linagliptin group, resulting in a significant difference after 4 weeks of treatment. This result strengthens our observation of a beneficial effect on renal endothelial function assessed by change in RPF due to L-NMMA with linagliptin treatment. Notably, the measured values are in line with those from previous publications about individuals with diabetes, which also indicated an increased NO production and/or action due to chronic hyperglycaemia, leading to alterations in intrarenal haemodynamics . Further evidence for this concept of an increased NO availability in early type 2 diabetes is supported by our results concerning secondary-objective variables. Previously we have shown that NOS inhibition (by L-NMMA) provokes albuminuria, unrelated to changes in blood pressure . Our finding, in this study, that the increase in UACR due to L-NMMA was enhanced in the placebo group compared with baseline, points towards an upregulation of NO activity in the ‘untreated’ placebo group. Further, our finding that there was a significant reduction in RA, and hence an increase in RE/RA, after placebo treatment is also supportive. It has been shown that the superoxide anion, indicative of oxidative stress, leads to vasoconstriction of the afferent arteriole . By immunohistochemistry, endothelial NOS but not inducible NOS, staining was observed in the endothelium of preglomerular vessels (afferent arterioles) of diabetic rats as opposed to controls . Moreover, after diabetes was induced by STZ in rats, the diameter of afferent arterioles (but not of efferent arterioles) and levels of urinary NO2 −/NO3 − were increased, both returning to baseline levels after treatment with L-NAME . These results support the notion that increased NO availability due to greater abundance of endothelial NOS provokes afferent arteriolar dilatation (with consequent glomerular hyperfiltration) in the early stage of diabetic nephropathy [6, 35]. This vasodilatory response of preglomerular vessels is obviously prevented by linagliptin, but not by placebo. Support for the beneficial impact of linagliptin on early renal changes also comes from our finding that tubular markers remained unchanged in the linagliptin group whereas there was a significant increase in TIMP-2 levels and a non-significant increase in KIM-1 levels after placebo treatment compared with baseline. In a case–control study using the Multi-Ethnic Study of Atherosclerosis, urinary KIM-1 concentration was associated with future risk of kidney disease (defined as incident chronic kidney disease stage 3 and/or rapid kidney function decrease) independent of albuminuria . In two community-based studies, lower insulin sensitivity was found to be associated with increased urinary KIM-1 levels, even after adjustment for confounders including eGFR and UACR . In individuals with type 1 diabetes followed-up for 5–15 years, after adjustment for baseline UACR, eGFR and HbA1c, baseline serum KIM-1 levels were predictive of decrease in eGFR and risk of ESRD . Our study also revealed that hs-CRP and MCP-1 levels were significantly reduced after linagliptin treatment compared with levels at baseline, indicative of a reduced inflammatory process (i.e. vascular injury), which has been reported in the early stages of diabetic vascular damage. It is worth noting that any influence of acute infection was ruled out, since hs-CRP values above 47.6 nmol/l (5 mg/l) were excluded. In an animal model (obese, hypertensive and insulin-resistant mice fed with a western diet), elevated MCP-1 levels were documented, and these were diminished after DPP-4 inhibition . Moreover, in Zucker diabetic fatty rats, vascular expression of the gene encoding MCP-1 was attenuated by the highly tissue-penetrating linagliptin even when compared with sitagliptin . In individuals in whom diabetes was uncontrolled and who had coronary artery disease, additional DPP-4 inhibition was found to improve endothelial function (assessed by reactive hyperaemia peripheral arterial tonometry) and decrease hs-CRP, in contrast to the control group. Moreover, linear regression analysis revealed a significant correlation between changes in endothelial function and hs-CRP but not HbA1c . In an accompanying editorial it was questioned whether oxidative stress, known to be increased in diabetes, may have impact on these results . A major limitation of our study is that we did not assess oxidative stress, although not all of its markers reflect the oxidative stress in the renal parenchyma. Estimation of intrarenal haemodynamics was based on a calculation model and was not directly assessed. Its reliability rests upon some assumptions. Therefore, we are aware that the model by Gomez, as with any other model using raw variables and constants, does not provide any information that cannot be gained from the raw variables. However, this technique can reliably be used in patients without kidney disease and with maintained renal function, particularly if intra-individual comparisons are to be analysed and if data are obtained twice within a short period of time. Our findings cannot be extrapolated to type 2 diabetes in general, since our participants were at an early stage of diabetes. The study treatment period was 4 weeks preceded by 4 weeks off treatment in the majority of participants (i.e. 8 weeks off active therapy in the placebo group). Interestingly, most changes in our biomarkers were noted in the placebo group and not in the linagliptin group. We therefore interpret our data more as preventive effects of linagliptin attenuating the natural course of the disease (as observed in the placebo group). In conclusion, our data suggest that treatment with the DPP-4 inhibitor linagliptin for 4 weeks prevented the impairment of renal endothelial function due to hyperglycaemia in type 2 diabetes. We gratefully acknowledge the expert technical assistance of O. Alter, D. Bader-Schmieder, I. Fleischmann, K. Fröhlich-Endreß, U. Heinritz, S. Muck, S. Pejkovic and L. Waldmann (all from Friedrich-Alexander-University Erlangen-Nürnberg (FAU), Erlangen, Germany). The present work was performed in fulfilment of the requirements for obtaining the doctoral title ‘Dr. med.’ (MK). Part of the work was presented at the 25th European Meeting on Hypertension and Cardiovascular Protection, Milan, 2015. The study was an investigator-initiated clinical trial funded by Boehringer Ingelheim to the University Hospital, Erlangen, Germany. RES has received speaker fees and consultancy and advisory board fees from Boehringer Ingelheim. PB has received research support from Boehringer Ingelheim. All other authors declare that there is no duality of interest associated with their contribution to this manuscript. CO contributed to the conception and design of the study, researched and analysed data and wrote the manuscript. IK, MK and SF researched data. CW and PB analysed data. RES contributed to the conception and design of the study, analysed data and wrote the manuscript. All authors revised the manuscript for important intellectual content and gave final approval of the current version to be published. RES is the guarantor of this work and, as such, had full access to all the data in the study and takes responsibility for the integrity of the data and the accuracy of the data analysis.